This weekend at Designer Con 2018 Tracy Tubera will be debuting his newest super hero sneaker resin figure – The Protro Knight! 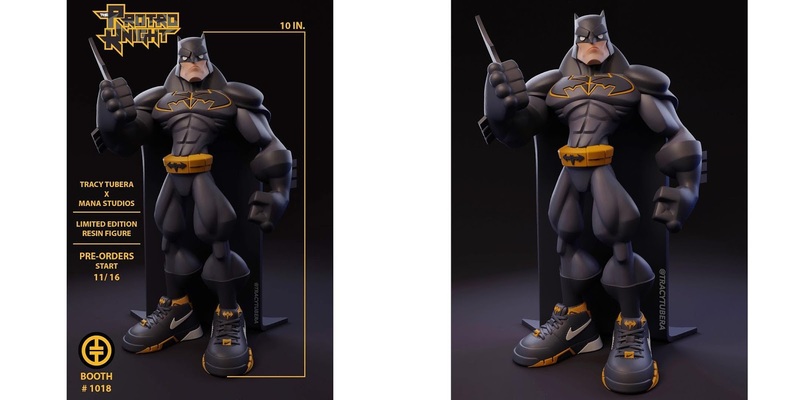 This amazing resin figure features DC Comics’ Batman rocking a sweet pair of Nike Protro 1 sneakers. Produced by Mana Studios, The Protro Knight stands 10” tall and is 100% hand crated, hand assembled and hand painted. Collectors can pre-order this epic Tubera-rific version of The Caped Crusader at Designer Con exclusively at Tracy’s DCon booth #1018 for $275.